Blue Fusion Wedding Band is a hugely popular and exciting wedding, party and function band based in Cork City. The band is made up of five fantastic musicians, who deliver a jaw-dropping show that will have you and your guests hopping. With both male and female singers fronting the band, their repertoire can be tailored to suit any audience. Playing hits from the classics to modern day makes them fun, energetic, and current. As band leader of Blue Fusion, Ian has spent a number of years working on multiple global leading cruise lines. He brings this world class experience to Blue Fusion insuring the highest standard of entertainment. The band takes pride in knowing that you and your guests will have a night of entertainment and music to remember. 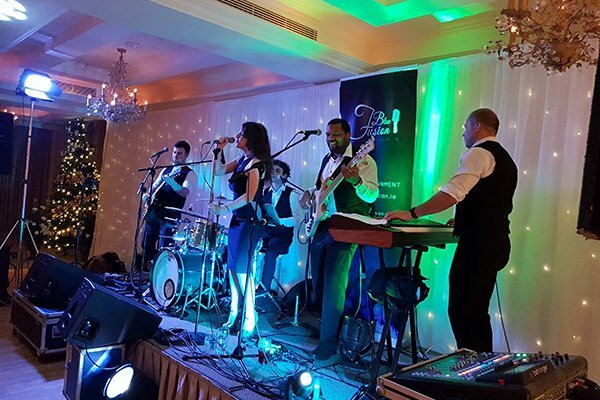 Blue Fusion are an established 5-piece band based in Cork, covering Weddings, Corporate Events, Parties and Functions across Ireland. To check availability and fees for Blue Fusion for your wedding or event, simply complete the form below, and we will be in touch with a custom quote within 24 hours.